There is what seems to be a war against pasta and bread, it has infiltrated my daily food choices but there will always be a place in my heart and mouth for an amazing bowl of pasta. My friends Matt and Jenny invited me over to their house to get saucy (I can’t help myself). They regularly make three different sauces and freeze them for future use. I have always been the Prego sort of girl so this was a great opportunity to learn how to make real sauce using real ingredients. On our chopping block this evening were the ingredients for Pesto, Red Sauce and a Puttanesca. I was tasked with rinsing/removing the seeds from the canned tomatoes for one of the recipes. This seemed like a pretty safe job to give me, I grabbed the tomatoes out of the colander in the sink, rinsed them, seeded them and then placed them in the bowl. I moved quickly and when I was done I cleaned up my work area, it wasn’t until moments later when Jenny was looking for the tomato juice that I realized I dumped out the entire pot containing the juice in my attempt to clean up after myself. As Jenny was walking around the kitchen looking for the missing pot I had to take ownership of my mistake. Hey guys, invite me over to learn and cook dinner with you, but be prepared as I am going to randomly throw out ingredients that we need. They were good humored about it and another can was opened and the process repeated itself, with better end results. It was obvious while working among Matt and Jenny and their two boys Liam and Zander that this wasn’t their first time cooking together. 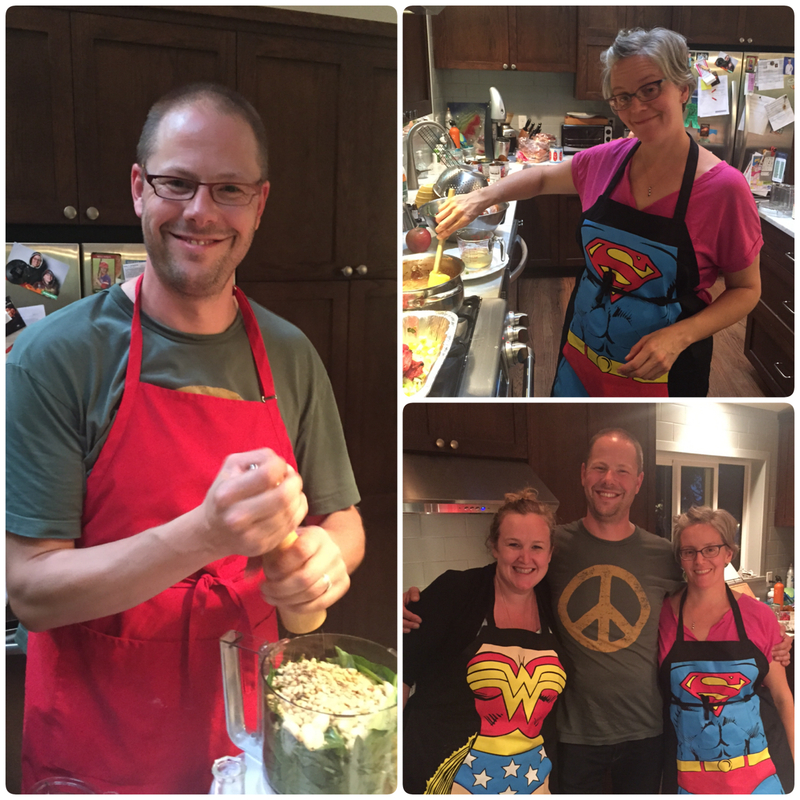 The kitchen was buzzing with the energy and love of a family spending time together. I am thankful that they invited me to join them. One of the greatest things about my Friendly Food series is getting to learn new recipes AND to sit down with my friends and their family after our kitchen time to a delicious meal, which nourishes both my body and my heart. Thank you so much Jenny and Matt for such a lovely evening! 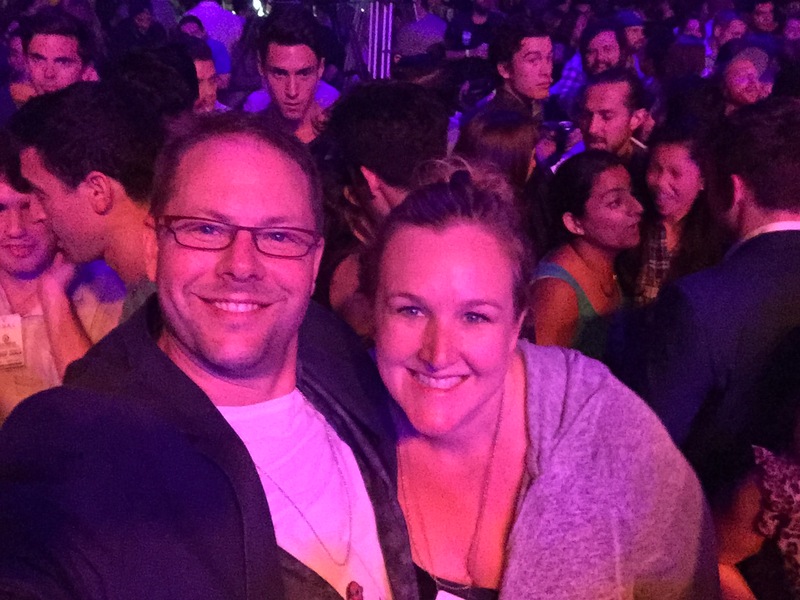 It took me a bit of time to write this post, I am spending the Fall in NYC and got caught up in fun activities such as joining Matt for a Snoop Dog show. Caught up with Matt and Snoop Dog in NYC! Strain the tomatoes of their juice into the sauce pot. Add the sherry vinegar, sugar, red pepper flakes, oregano, and basil to the tomato juice. Stir and cook over high heat. Once bubbles begin to form on the surface, reduce to a simmer. Allow liquid to reduce by 1/2 or until liquid has thickened to a loose syrup consistency. Squeeze each tomato thoroughly to ensure most seeds are removed. Set the tomatoes aside. Cut carrot, onion, and celery into uniform sizes and combine with olive oil and garlic in a non-reactive roasting pan over low heat. 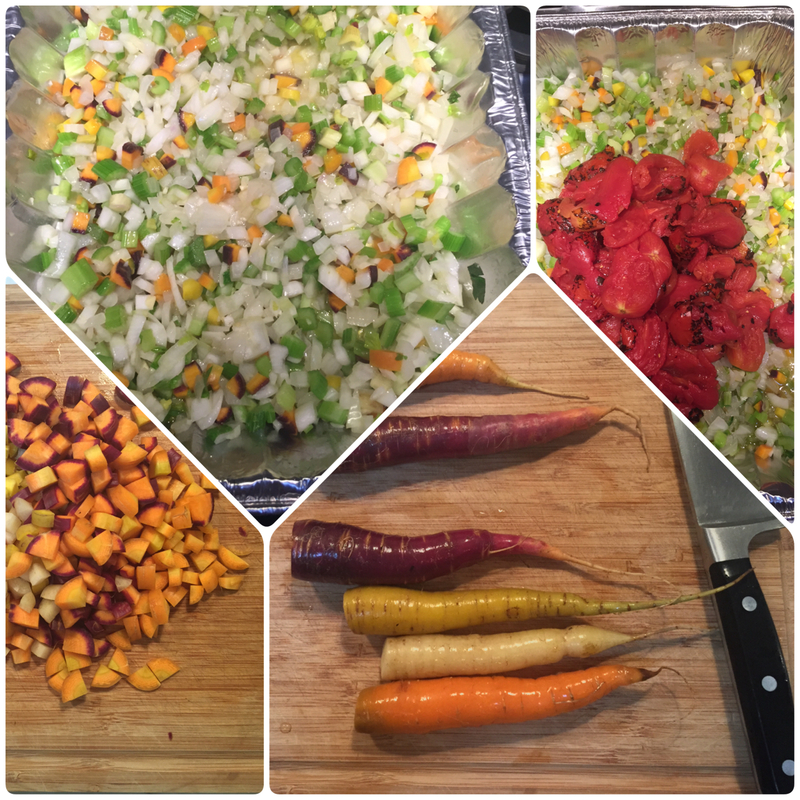 Sweat the mirepoix until the carrots are tender and the onion becomes translucent, 15 to 20 minutes. Add the tomatoes and capers to the roasting pan. Place roasting pan on the middle rack of the oven and broil for 15 to 20 minutes, stirring every 5 minutes. Tomatoes should start to brown slightly on edges with light caramelization. Remove the pan from the broiler. Place the pan over 2 burners on the stove. Add the white wine to the tomatoes and cook for 2 to 3 more minutes over medium heat. Put the tomatoes into a deep pot or bowl and add the reduced tomato liquid to the tomatoes. 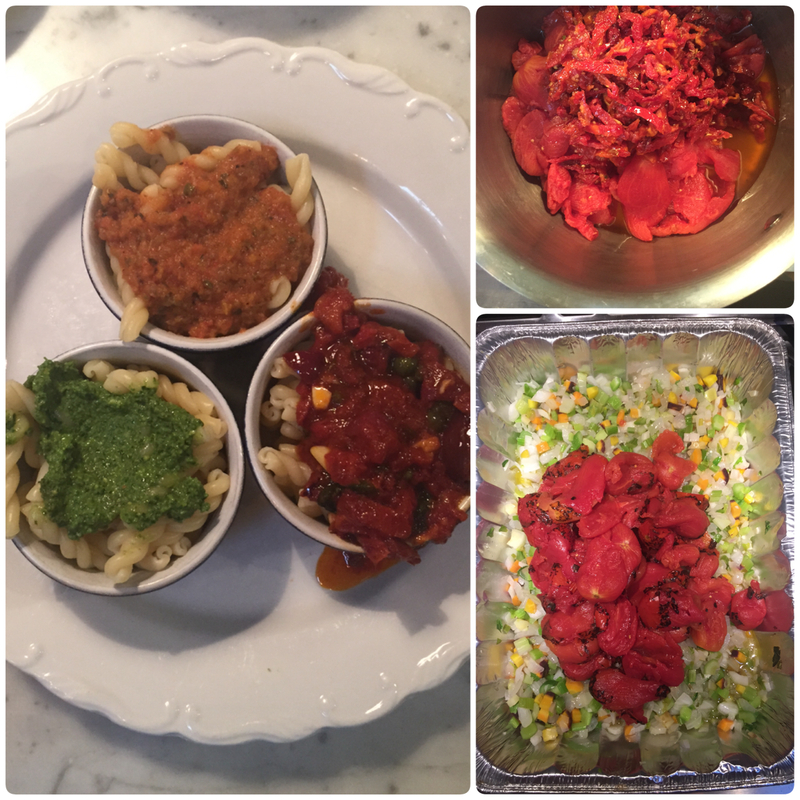 Blend to desired consistency and adjust seasoning. 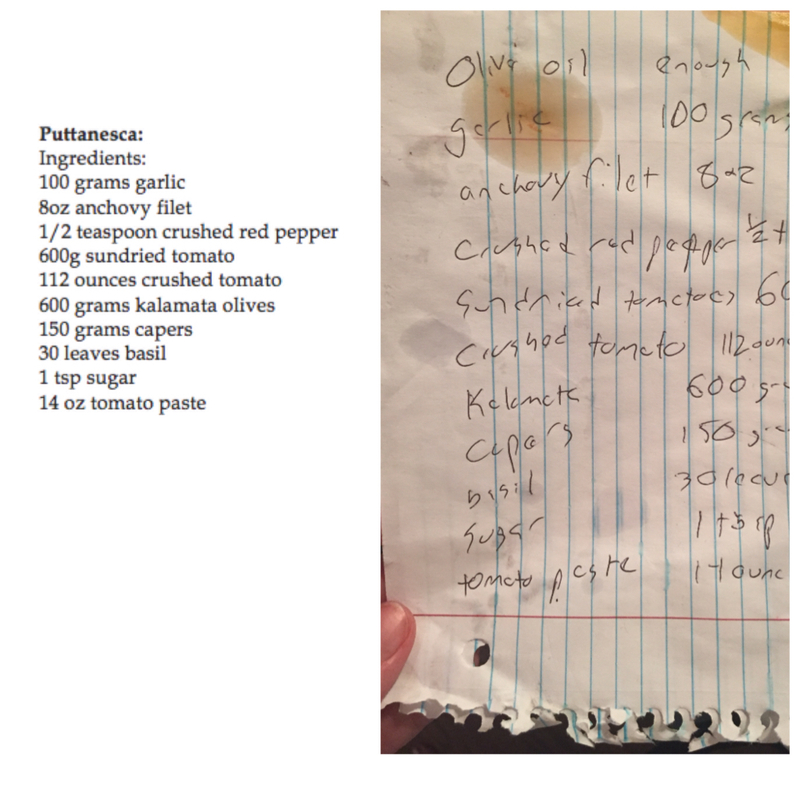 Directions: Place one-third of the olive oil in a blender and add the remaining ingredients. Blend until smooth. Add the remaining olive oil and blend. Heat the olive oil over medium high heat. Add the onion and saute until soft and lightly caramelized, about 6 minutes. Add the garlic and cook an additional 2 minutes. Add the tomatoes and the remaining ingredients and simmer until the sauce is thickened and slightly reduced, about 40 minutes.